So what’s the over-under on RGIII getting hurt on this play? The game is already out, so if you’re reading this review, odds are you’re on the fence as to whether you should get the game, as EA Sports releases this popular title every year with minor changes barely worth a mention at the water cooler. The series needs no introduction as it’s literally the only video game representation of American football on the market. Now in its third installment of the current console generation, we’re really starting to see what EA Sports is doing with the long-running football sim. 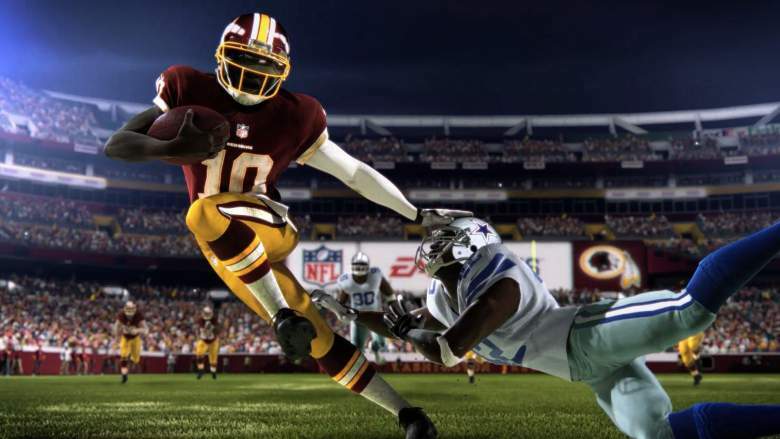 The series gameplay has seen some real progression and improvement, albeit slowly, since the debut of the Infinity Engine in Madden NFL 13, which aimed to bring more realistic physics to the game. 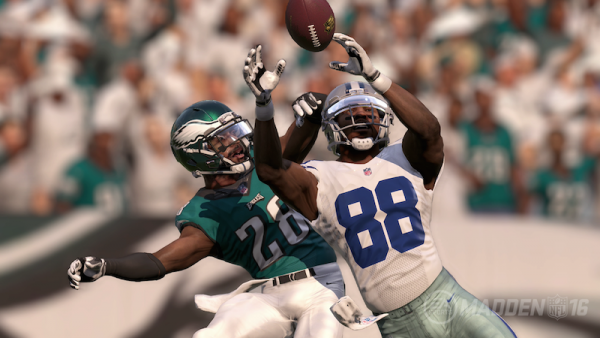 Madden NFL 16 continues the series’ current pattern of enhancing the gameplay, but whether or not it’s because of this focus, the overall presentation continues to be seemingly neglected. Last year’s entry focused more on the defensive side of the ball. It introduced new camera angles and a few nuances in gameplay. Defense became more enjoyable with the ability to shed blockers, while the offensive side of the ball mainly saw cosmetic alterations that really didn’t affect the game. 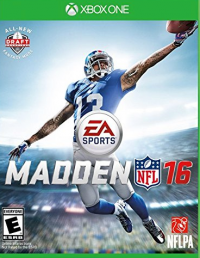 Be that as it may, Madden has always offered an enjoyable game of football, with the latest entry continuing the series’ upward trend of constant improvement. Passing and catching, arguably the most important facet of an NFL offense these days, take front and center with the gameplay’s retooling. As far as passing goes, the basic controls from previous games in the series remain intact along with some nuances that’ll really change the way you play. While bullets, touch passes, and lobs are unchanged, you now have the ability to throw high and low passes by holding the left shoulder and trigger buttons respectively as you throw the ball. These new options in pass trajectory can really impact the game and highlight the differences between a Madden novice and expert. In the Skills Trainer, or on your own, you’ll learn when you’ll want to throw these different kinds of passes. For example, high passes are ideal for lobs deep down the field, while low passes are ideal for comeback or curl routes to your receiver. These additions pretty much give you a better idea of the depth of your passes as most of the interceptions players will throw now should ultimately be their fault. The next big change is in the game’s catching mechanics, and to be honest, they’re actually a bit overplayed and overhyped by the developers and other publications. When the ball is in the air, you can hold A (X on PS4) for a possession-type catch, X (Square on PS4) to prepare to run after the catch (RAC), and Y (Triangle on PS4) for an aggressive-type catch. Receivers can now make possession, RAC, or aggressive catches just by holding a button. Ideally for the redzone or short yardage plays, the possession-type catch is typically performed to ensure that your receiver catches the ball regardless if a hit is coming. While it increases the odds of a catch, the odds of gaining additional yardage after the catch are slim. With room to turn up field, the ideal catch method would be run after the catch “RAC,” so your receiver can continue his path towards pay dirt. It won’t be ideal if there’s safety help over the top as it puts the receiver in a position to get wrecked. Finally, an aggressive-type catch will really test your receiver as most of the time it’ll be a jump ball or a pass that’s highly contested. The problem with this type of catch is if your receiver doesn’t come up with the ball, he’ll either get wrecked, or the ball will be tipped which could easily result in an interception. All in all, it’s really all worth practicing in the game’s Skill Trainer and Practice mode options. As cool as these new catch animations are, let’s get back to what I was saying about these being overhyped. Like the new pass trajectories, making use of these features is completely optional. When the ball is in the air, the CPU will already adjust to your throw to make the catch. In fact, when the ball is in the air, you’ll already see what kind of catch the receiver is trying to make. And more often than not, that computerized decision is the correct choice. Yes, maybe you have a better idea of how you want your receiver to adjust to the ball, but at the end of the day it’ll more likely than not end up with the same result: He’ll either catch it, or he won’t. As far as the modes go, everything Madden fans have grown accustomed to are intact along with some new modes of play that are really just variations on the familiar ones. 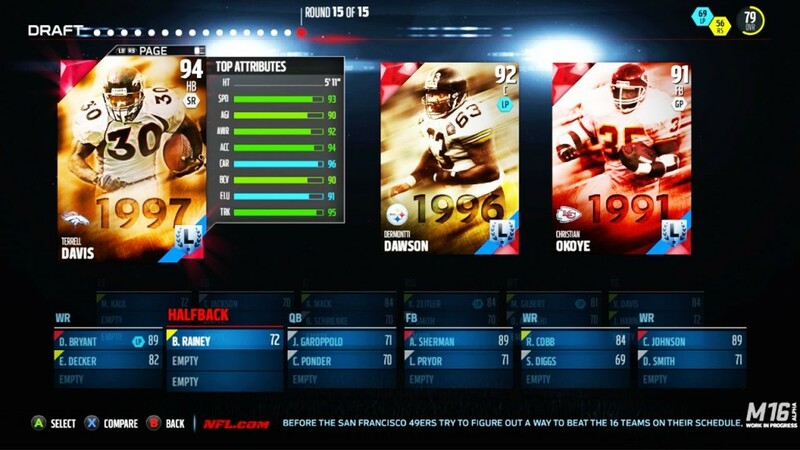 Draft Champions allows you to build to your own team’s style, and even gives you access to NFL Legends like Terrell Davis with your picks. The big one here is Draft Champions, which is really just a variation of the popular Madden Ultimate Team (MUT) mode with more of a fantasy football dynamic. While you’re still assigned a number of different football players on your team with the opportunity to upgrade them by continuously winning, you now have to first select from a pool of coaches, followed by players that are instant upgrades from the ones on your default roster. For example, if you select Pittsburgh Steelers Head Coach Mike Tomlin, it’s best advised to select players that fit Pittsburgh’s overall style of relying on the running game and a zone-oriented, hard-hitting defense. Of course, you’re free to sway away from your coach’s style with the pool of players you’re given, so that’s completely up to you. You’re then given a goal to accomplish, usually in the form of winning a few games. If you lose, depending on the goal, you usually have to re-draft and start from the beginning with what’s likely to be a totally different roster. Of course, MUT, Franchise, Skills Trainer, and Practice modes all make a return, though they’ve all been relatively unchanged aside from the menus as well as the way they’re presented. The game is also the best looking Madden to date. Though that’s expected every year, the enhanced progressive scan really makes all the players, including the kickers, actually look like their real life counterparts, and the blocking, tackling, and catching animations look a whole lot more authentic. But since we’re on the subject of authenticity, not all is well. It’s no secret that American football is the most popular sport in the country, so with that, there’s no excuse why the game’s presentation continues to be the black sheep in EA Sports’ otherwise proud portfolio. 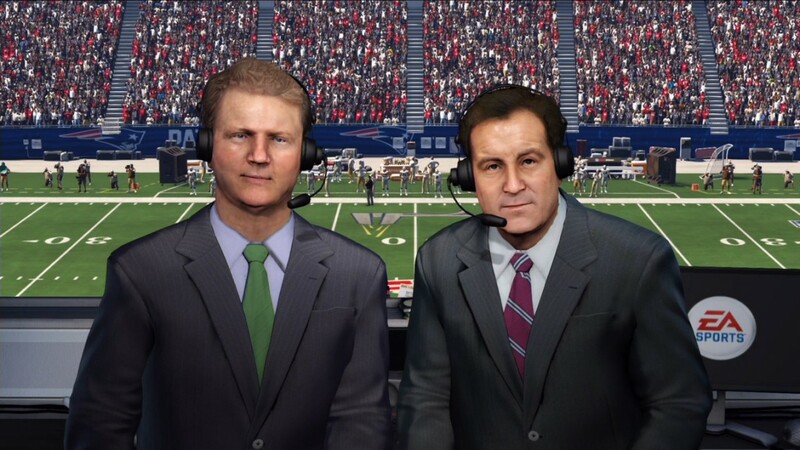 EA Sports’ PGA Tour, NHL, and FIFA franchises all feature an outstanding presentation easily mistakable for real games, and as great as Madden looks, it doesn’t look remotely close to an actual telecast. NCAA Football 14 did a fantastic job with its presentation, taking advantage of EA Sports’ exclusive license with ESPN, but there’s been no legitimate attempt at using this with Madden. This makes me sad as a football fan, especially considering the fact that there hasn’t been an NCAA Football game released since 2013. The last negative, unfortunately, comes in the form of problems that really shouldn’t even be issues. With a renewed emphasis on penalties, for some reason quite a few people reported unstoppable encroachment penalties done by the CPU. The game even suffers from random hiccups and game freezes mostly in menus, which happen more frequently on the Xbox One. EA has already announced they’re working on a patch, and these will all be fixed soon, but these issues raise the question as to whether the game was even playtested in-house in the first place. Regrettable presentation and questionable bugs aside, Madden NFL 16 is superior to last year’s game in just about every way (including presentation, ironically). While the new methods of catching the ball don’t necessarily change much in terms of gameplay, the addition of controlling pass trajectories is a very welcome one that should definitely be a new series staple. Both Franchise and MUT modes haven’t seen much change, but they didn’t need to, and to this day Madden‘s online franchise is still the best mode of its kind in the sports genre. All that said, it’s Madden season, so let’s get #backtofootball. The Xbox One version of the game purchased by the reviewer was the primary version played for purposes of this review. The game is also available on PlayStation 4, Xbox 360, and PlayStation 3.